Product Design Lecturer and Designer in Residence Helena Ambrosio is showcasing two products at the 100% Design event at Earls Court from 17 to 20 September. As part of her residency with the Department of Design Engineering and Mathematics in the School of Science and Technology, Helena has been exploring different approaches to the creative process. Rather than sketching her design ideas, Helena uses paper to create the first draft of her design by folding and cutting it. 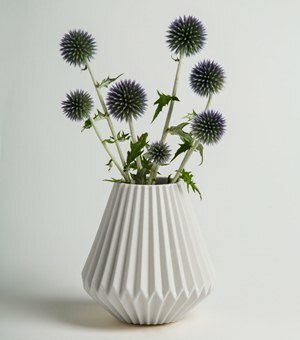 Once happy with her design, she then puts it through CAD (computer- aided design) and 3D printing before it's formed into a ceramic or porcelain object. Discussing what inspired her to use this creative process, Helena says: "I get inspiration from paper folding and cutting. I also associate paper's delicate and clean shadows with the shadows you can create with porcelain." 100% Design is the UK's largest and longest-running design trade event, and Helena is eager to gain some positive feedback from the public as she is hoping to create more porcelain objects for the home using this process. "I'm really excited about having my first two pieces on show at 100% Design. It's such a great and popular event and I look forward to seeing how people react to them." Helena's first two pieces, a candle holder and vase both in porcelain, will be on show at stand L120, complementing hand-crafted contemporary furniture by Young and Norgate. More information about Helena Ambrosio and her work can be found on her website. Find out more about the 100% Design event.